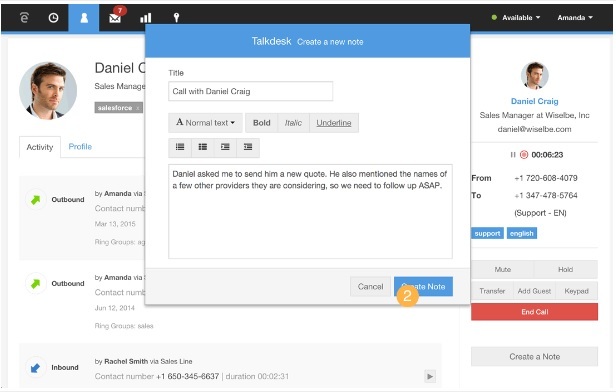 Talkdesk is a new breed of call center software, requiring no special hardware other than a PC and an Internet connection. It is headquartered in San Francisco but also has offices in Portugal, Australia, Brazil and the United Kingdom. Call centers have become a necessary component to businesses for appropriately receiving inbound calls and executing outbound calls. Talkdesk developed a solution to cater to these needs with a powerful phone system, requiring no special hardware and integration with 28 other popular business applications. The Talkdesk call center is a cloud-based service aimed towards serving enterprise level businesses with a high quality scalable VoIP service, packed with many modern call related features. Agents are provided with a high availability system that integrates with a variety of different third party services, depending on the needs of their business. Unlike some other call center solutions, Talkdesk adapts for a variety of different models such as outbound heavy sales departments, customer representative divisions reliant on a flexible incoming service and truly, everything in between. After setting up an account, an admin has the ability to manipulate service features to customize a solution for their needs. Base pricing comes in three different tiers with each adding more performance to the system. The Regular plan runs at $29 per month, per agent, for up to 5 agents. This service offers many of the many basic call center features but lacks some of the more powerful options to control call queues and integrate other services. The Pro level runs at $55 per month, per agent, and includes greater control over call queues and features a much higher level of integration for popular Ecommerce and CRM solutions. The Enterprise category costs $99 per month, per agent, and adds even more powerful features such as a web-to-lead tool and highly advanced call-reporting tools. All of these rates assume annual billing. Every level of service provides a decent core solution for any standard call center plus, a handful of advanced features. For example, starting with the Regular plan, calls may automatically route to associates based on skill. The service does not require hardware so computer friendly tools such as click-to-call are available so there is no fumbling with equipment during or between calls. Even the regular plan has the ability for a user to annotate notes during calls. This is very useful when not taking advantage of a CRM system or similar application. Beyond the Regular plan is where the product shines. Starting at the Pro level, integration of CRM applications like Salesforce, Microsoft Dynamics, Zoho and many others is possible, enabling information syndication as well as calling directly from any system's contact directory. Talkdesk also has the capability to utilize certain web-based software for helpdesk and Ecommerce products such as Shopify, Magneto and Bigcommerce. With the Enterprise package, further refining of Talkdesk is possible via an included API. A developer with proper skills can conceivably integrate far more business critical applications than those available in stock service offerings. The Enterprise offering also comes with a full Service Level Agreement (SLA) and a dedicated account manager. Reporting functions are offered with the Pro pricing plan and beyond, boasting both real time and historical reporting. This is very useful for both evaluating agents in the workforce and overall business performance. High-volume call centers have the option of utilizing the Enterprise service packaged with a daily reporting service to track performance metrics with much greater accuracy. Even without the higher tiers of service, basic reporting is available in the form of both desktop and email notifications, should a call fail to complete or arrive at a voicemail during business hours. The support section of its website has a decent selection of FAQs, feature and integration guides along with numerous troubleshooting tips. For the most part, Talkdesk is a very reasonably priced service, including several value added features. With that said, it seems a few other factors should be considered before selecting this company as your call center solution. All minutes require additional payment, meaning minutes are not included at any tier of pricing. In both the US and Canada, inbound and outbound calls run $0.02 and $0.03 per minute, respectively. Although inbound calling is not too bad, per market standard, outbound calls cost a little more. Assuming your company is using the Regular plan with 5 agents making calls for 6 hours a day, this comes to $54 per day! However, after talking to Talkdesk, it is possible to utilize a custom SIP trunk provider that will likely alleviate a lot of the extra calling costs. The Enterprise plan does not appear to have a great deal of value. The reporting aspects are useful however, the additional cost to have that feature may not be worth it. Naturally, this all depends on the nature of the business or department using the service so it would be wise to have a thorough discussion with a sales associate before making a final decision. Further, if not utilizing a developer, the Pro service has ample offerings for most industries. Surpringly, considering the price for the Regular and Pro plans, no phone support is available only email support. Three tiers of increasing call center solutions at $29, $55 and $99 per month, per agent. Does not require specialized, expensive equipment. Agents can use headsets and a standard PC and perform calls all from within the software, utilizing features such as click-to-dial. Pro and Enterprise services integrate with many popular CRM, Ecommerce and helpdesk systems. Simple reporting services available with the Regular service and more advanced reporting is included with Pro and Enterprise plans. Domestic calling is not included with any level of service. Inbound calls run at $0.02 per minute while outbound calls are $0.03 per minute. However, custom SIP trunks may be utilized instead. The call center has become a necessary component for many business models in various industries around the world. Talkdesk does a great job at providing customers with a powerful solution even with the most basic tier. The ability to use CRM systems with not just call centers, but any VoIP service, has become a staple in the communication industry. Even small businesses see great benefit by accessing a realm of customer information with minimal effort. In large environments, it is practically a requirement. Talkdesk features a highly versatile platform for inbound, outbound and combination call centers. The service accommodates above and beyond what most popular systems on the market offer. Not to mention, for those seriously looking to take it a step further, the Enterprise service offers an API for custom integrations. Even though the price point per minute for calling is a little high, the company appears to have a good track record of accomplishment in terms of pleasing clientele. Talkdesk reviews are listed in chronological order. We have used Talkdesk for at least one year. It was quite easy to set up, my sales team has PCs and headsets for handling all our calls. They seem to like the software. The integration with Salesforce is key!